To decide what to pack 5 days a week in my daughter's lunchbox, has become a big challenge for me. As recently her choice circulates among burger, hotdog and pastas only, which I don't approve for each week. 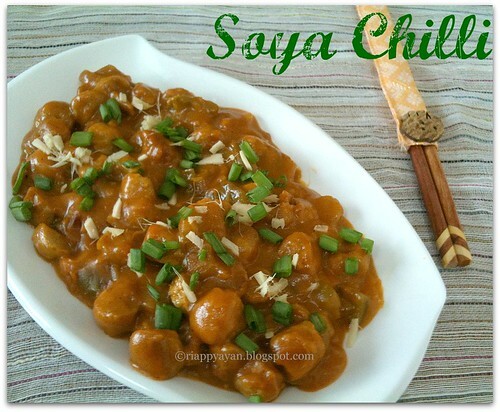 So last week I tried this soya chilli and then one idea clicked me, why not make a chinese style fried rice with this soya chilli, which will be tasty as well as healthy and filling. For my surprise, she liked it and gave her approval that I can pack this for her lunch-box next day. I was so happy. 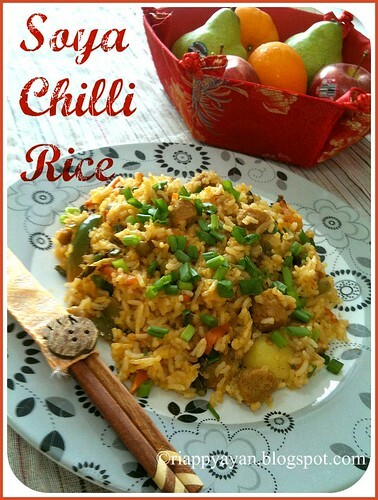 This Soya chilli rice is a great lunch-box menu for older kids as well as grown-ups. Tomato ketchup/sauce : 2-3 tblsp. Chilli sauce : 1 tblsp. Corn flour : 2 tblsp. Soy sauce : 2 tblsp. Boil water in a big vessel with salt. Add soya chunks and boil for 3-4 minutes in there, then remove from heat and keep aside for soaking for 15-20 minutes. Then strain(reserve the liquid for later use) and pass them through running water, when cool squeeze well and keep aside. Chop onion and capsicum into cube-like pieces. Heat oil in a pan, add chopped onion and capsicum, fry until onions are transparent. Add ginger-garlic paste, chopped green chillies, salt and black pepper and soya chunks. Fry for 1-2 minutes. Then add tomato sauce, chilli sauce and corn flour mixture(in a bowl prepare a mixture with cornflour mixed with 3 tblsp. water, soy sauce and vinegar). Mix well everything. Then add the reserve water of about 2 cups, you can add plain water if reserve water is not enough. Stir well, add salt if needed and cook until soya chunks get soft. Remove from heat. Enjoy with plain rice or fried rice, goes also well with roti. 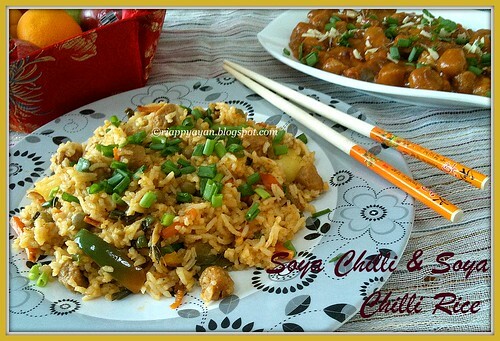 Or You can try this Chinese style fried rice with this soya chilli, too. Cook rice until done, don't overcook them. Keep aside. Heat oil in a pan, saute chopped vegetables along with onions until tender. Add chopped ginger, green chillies, saute for 2 minutes. Then add cooked soya chilli, mix well together. At this moment, add cooked rice, cooked potatoes, spring onion(leave little for garnishing), season with salt and black pepper. Stir for 2-3 minutes. Remove from heat and garnish with rest of the chopped spring onions. Lovely chinese combo dish. Send this to flavours of China. wow both r so so yummy esp soy chilli love it..
Omg, wat a wonderful spread, makes me hungry..
Looks yummy .. if interested do send it over to my Dish it out event. Nice...A delicious combo! Would love to gobble them! 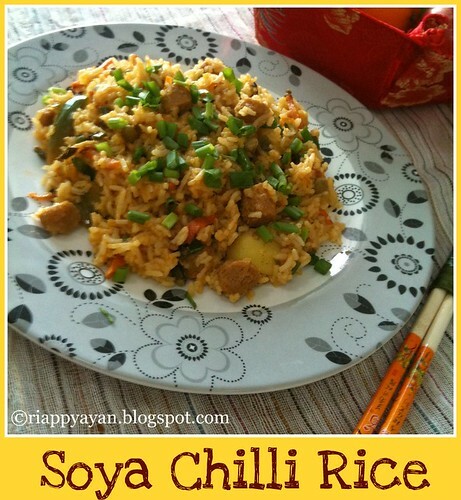 first time here.. soya chilli and soya chilli rice look awesome.. bookmarked.. enjoyed viewing your other recipes as well.. glad to follow you... do visit my blog if you find time..
absolutely tempting recipes...love your excellent presentation..! This looks so tempting Indrani... will make it one of these days!